| [MMM] When Should You Go Back to the Drawing Board? Home > Blog	> [MMM] When Should You Go Back to the Drawing Board? [MMM] When Should You Go Back to the Drawing Board? 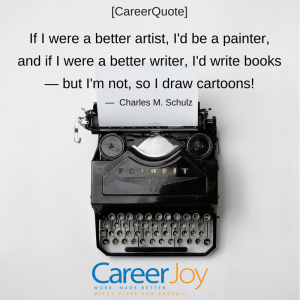 Even professionals in their field of work such as Charles Schultz, the creator of the famous comic strip Charlie Brown, can lose track of the basics. Charles often tells the story of a day when he was about 15 years into his comic strip, and he sat down to draw Snoopy in front of his typewriter, like many other days. The only problem was that he forgot how to draw the typewriter! Often times along our career search, we can forget the basics. We start along a path and completely miss out on a key and obvious element. Some of the biggest mistakes in life are a result of missing a basic element. Did Charles know how to draw a typewriter? Absolutely. Sometimes in life we need to be reminded of the basics. We call it going “back to the drawing board”. Not because we don’t know how to do it, but it just needs to be seen from a new angle, a fresh perspective. Whether you need a new angle or a fresh perspective, our coaches have lots of pen and paper available for you. So let’s start drawing!